The Apocalypse…a time predicted to come when destruction and chaos run rampant throughout the earth. Homes will be destroyed, cities burned, deaths in uncountable numbers. Fact or fiction, being prepared for the worst is a skillset every person living on the earth should possess. Knowing how to build a fire, catch food in the wild, and make shelter are just three of the most basic skillsets you can perfect and prepare for with the help of the Apocabox. 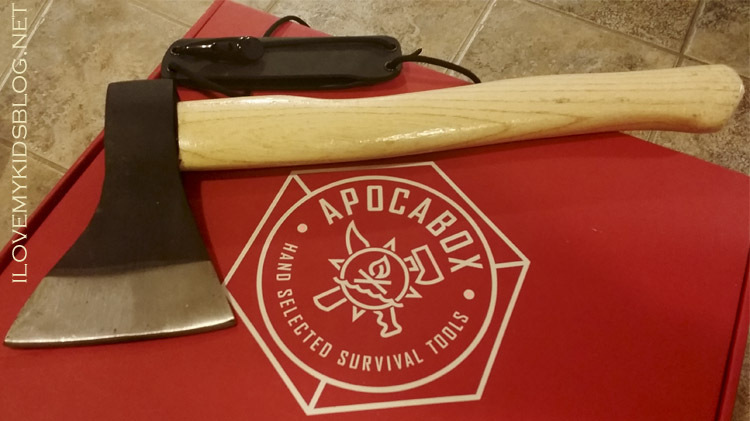 The Apocabox is a bi-monthly subscription box that is filled with multiple items to begin or enhance your survival skills. 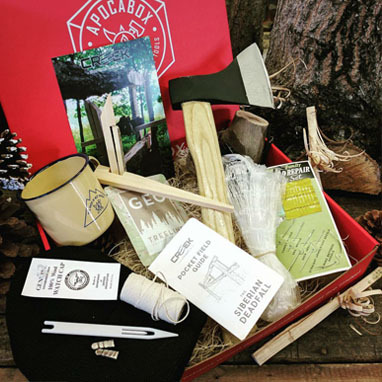 It is one of the most unique survival boxes out there because Creek Stewart, the master outdoorsman behind the box, hand selects every item with a detailed purpose in mind. Some items are so unique that they have been handcrafted just for those who receive the Apocabox. To start your subscription, click HERE. I have had the privilege of corresponding with Creek and have really grasped his passion for all things survival. 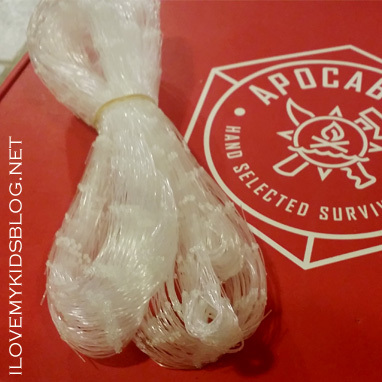 One of the reasons I wanted to receive the Apocabox is to gain skills necessary for the outdoors. Camping is scary enough for me, but having to survive in the wild with the knowledge and skills I have now, oh man, I would not make it. As a mom, I have decided that I need to have more experience and understanding of the outdoors and how to create a sustainable life for me and my family. No one can ever predict the future, and being prepared for the worse is always better than not being prepared at all. I had the opportunity to receive the December 2016 Apocabox. The theme of this box was based off of one of Creek’s favorite documentaries titled, HAPPY PEOPLE: A YEAR IN THE TAIGA. 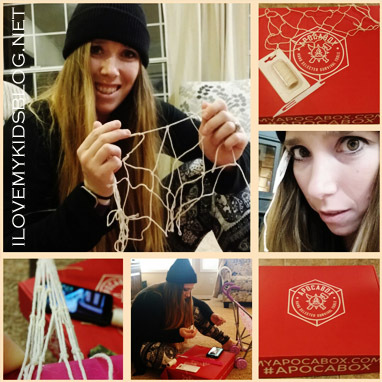 The skill challenge introduced for this box was learning to weave a gill net with twine and a handcrafted needle. When I first opened the box, I felt very out of my element. I am a legging wearing, mom bun sporting, mother of 4. I have very limited experience with the great outdoors. Literally have been camping less than ten times. Now in front of me I have a box full of items I have never seen or heard of. My husband was like a giddy school kid and couldn’t wait for the unveiling. Apparently in the Taiga, the Russian trappers used small axes for just about everything. The design of this axe has a very unique shape that Creek was able to have replicated. The blade was hand sharpened in the USA, as well as fitted with a custom formed kydex sheath for protection. According to my husband, the sharpness of the blade is greater than any axe he has ever purchased. Gill net fishing is one of the main ways the Taiga feed their families. This gill net is small, yet effective. It is designed to work with small waterways, such as streams and creeks. Instructions on how to properly use the gill net are included in the box. Gill net fishing is apparently illegal in many areas, however, if it comes down to surviving, having this on hand could literally be a matter of life or death. This kit provides one complete trigger system, as well as raw wood pieces to carve your own. Trigger systems are used to help capture wild animals for food and fur. Having the skills kit is one thing, but learning how to make a successful trigger system is a skill that takes time and practice to master. 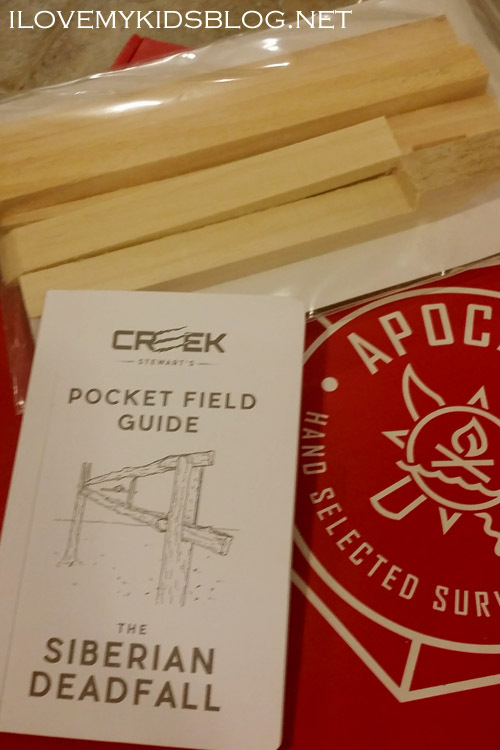 This pocket field guide is a step-by-step booklet that teaches how to make and use the deadfall sets. It is small and lightweight. Make sure this little fella ends up in your survival backpack. It will be a very helpful asset to rely on, especially if YouTube isn’t available. Having a good set of needles can enhance the ability to fix gear and clothing if the situation presented itself. I also think it could be helpful to use in an emergency situation where stitches are needed. 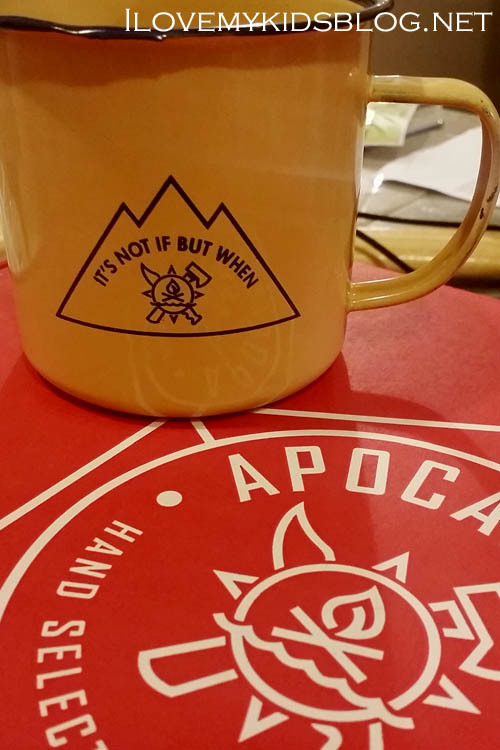 Helpful during the cold nights, this mug can be clipped to a backpack or carabineer easily. Arguably some of the best artisan roasted coffee on the planet, this Treeline coffee packet can bring comfort to you on a cold, dreary night. 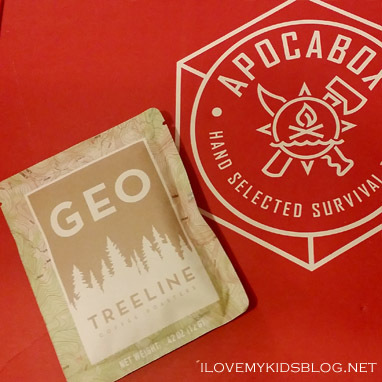 Treeline prides themselves on being adventurers and outdoor enthusiasts. That makes them a perfect company to pair with for this product. 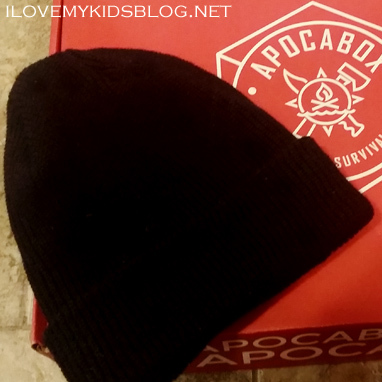 The perfect hat to survive in the Taiga is one that can withstand the coldest of cold nights. This wool cap does just that. With its ability to provide warmth and comfort, it can be worn at all times of the year. This needle is helpful then weaving a gill net. 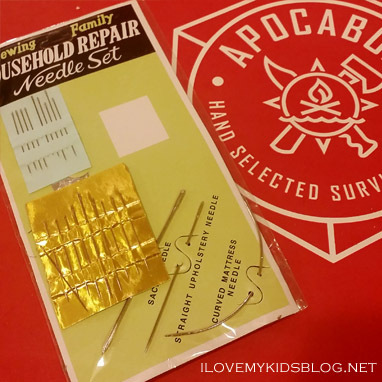 If you do not have the tools necessary for hand crafting your own net weaving needle, this one is a perfect alternative. I used it to create a gill net, but may eventually learn to hand carve one someday. This twine is what you need to make a small gill net. I would recommend getting more twine similar to this, because this small spool will not allow for multiple gill nets. Plus, it can be used for other survival tasks as well. Each month a challenge is issued to those who receive the box. This month, the challenge was to weave your own gill net. I watched the tutorial on how to make the gill net numerous times before attempting my first gill net. Feeling confident that I could master this skill, I began weaving. To my frustration, my first attempt was a failure. I was surrounded by distraction, which I know had something to do with it. After refocusing, my second attempt was a success! I got comfortable using the net weaving needle, and was so excited to complete the first few rows of a gill net. This is a skill I NEVER knew about or had experience with. 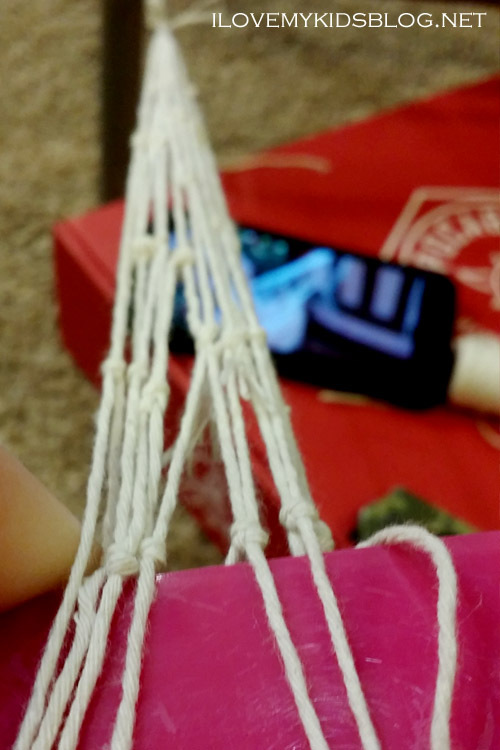 Now, thanks to the Apocabox challenge, I can make a net easily with twine. I think this technique can also help create netting to help hold items around camp and many other things. 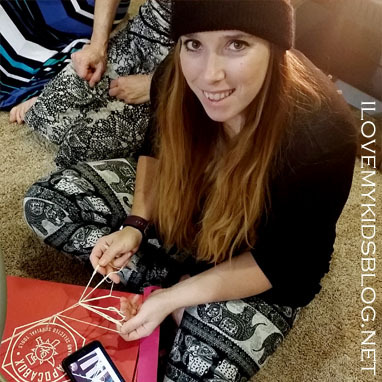 I am excited to continue enhancing this skill and testing out different uses for net weaving. 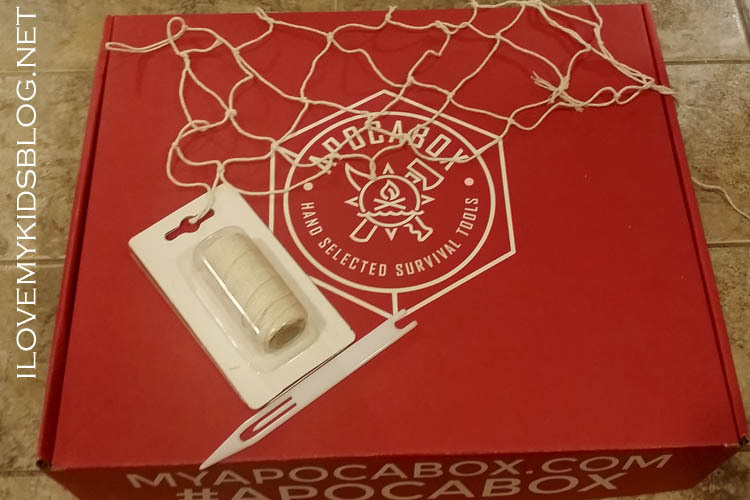 The Apocabox is a great subscription box for anyone who is seeking survival skills, tools, and equipment. I am excited to share my journey of becoming more comfortable with the outdoors and enhancing my survival skills throughout 2017! 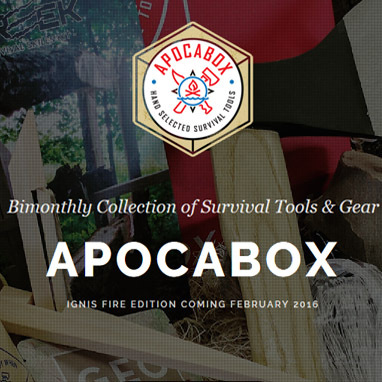 The February box is themed “IGNIS FIRE”. Are you excited yet? To see past boxes and details of the items included, scroll down on the Apocabox website. Apocabox provided me with this product for review. Regardless of this agreement, the words expressed are my own honest opinion.